Perfect little set for our deck. I added seat cushions. Very comfy to dine outside. All pieces are very sturdy and attractive. Nice color and all smooth edges. 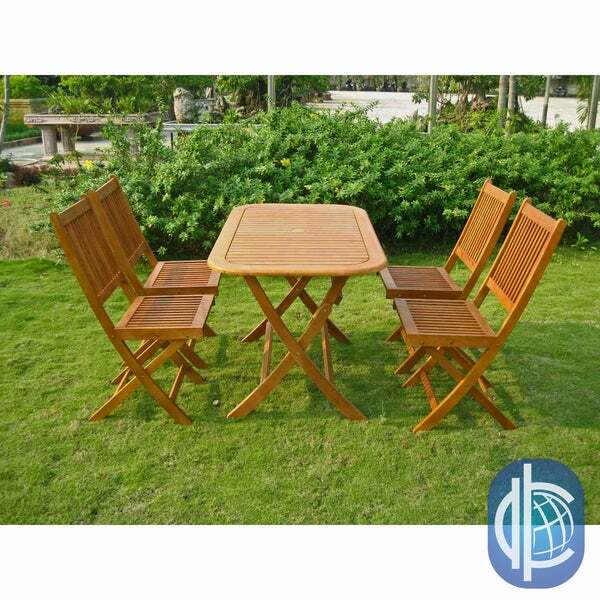 Enjoy great outdoor dining experiences with this five-piece folding outdoor dining set by International Caravan. The table and four chairs of the Royal Tahiti Melilla dining set are constructed for years of stylish yet durable service. The transitional-styled set, made of long-lasting teak wood and yellow balau hardwood, has a classic oval-shaped table that is perfect for entertaining. An umbrella hole in the table center lets you add shade for extra comfort on sunny days. Invite the neighbors over for an afternoon of food and fun with this outdoor dining set. This five-piece set features a natural wood finish that easily blends into your outdoor environment and is both weather-resistant and UV-protected for many years of usage. Add an umbrella for additional shade using the included umbrella hole. This set is a beautiful honey gold color. Though if you don't treat it, it does fade. That would be my only complaint. If you put a little effort into maintaining it then it will be no problem. The table and chairs are sturdy and well made. I get compliments on this set all the time - a nice natural alternative to plastic sets, and a unique alternative to glass top patio tables. This is a gem of a set . . . fits the area so nicely, love that all the pieces fold up. Great patio set, arrived quickly and excellent quality. Chairs were already assembled and the table required a few simple steps to set up. I would definitely recommend. The set arrived quickly and in perfect shape, and was relatively easy to assemble. The chairs are ready to go on arrival, and the table takes a little assembly, which was sort of confusing, but very doable. The picture represents it perfectly, and it is a really cute set for our front porch. I do plan on giving everything a coat of tongue oil for additional weather proofing. I didn't give it 5 stars simply because it is not what I would consider heavy duty. I feel like it will hold up pretty well, but I would be concerned if a very heavy person sat on one of the chairs. The table set is nice and would be well worth the price if not for numerous quality issues. Our set arrived with chips in the wood as well as some knots and the finish was poorly done, giving the appearance of wear marks around the perimeter of the table top and some on the chairs. I took pictures and presented them to Overstock CS. They were able to give me a partial refund so I didn't have to mess with shipping this item back. This was very easy to put together (took less than 5 mins), however after one season outdoors the table has warped. I covered it during the winter and still warped. The chairs are fine, they are smaller though, not sized for men 6’ or taller. I bought this set for my daughter... small back yard area in the city...it is perfect ... looks great and functional!! It is a well make product and I am happy I got it. Great set for the price - only complaint is that it was missing a nut and i have yet to receive a replacement from Overstock - but looks great. Way too small for the cost. Had to take apart more than once to get it right. The back rest leans back a little too far and it is uncomfortable to relax in. "What is the weight capacity on the chairs?" "How does the table fold?" Hello erauch, the table top pulls up on one side and then goes down so it can be stored completely flat. Thanks for shopping with us! "Has anyone left it outside in snow/ice over the winter? Or do you need to store it inside?" Hello outsidemama, we appreciate your inquiry. Although this set was designed to be used outside and is fairly weather resistant, we recommend covering it during winter for maximum longevity. Thank you for shopping with us! "Can you buy extra chairs to go with this set?" Hello pjgant, please see ITEM#: 12409316 for additional chairs sold separately. Thank you for shopping with us.